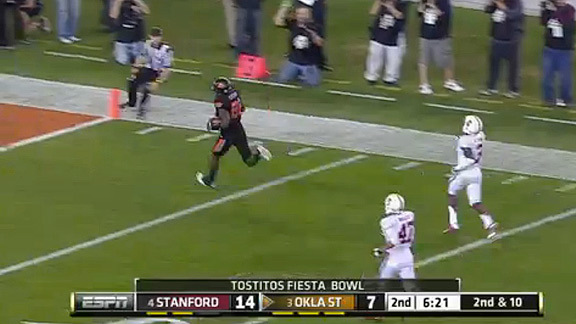 Despite being outgained by Stanford by almost 180 yards in total offense, and outrushed 243 yards to 13, Oklahoma State won the Tostitos Fiesta Bowl on Monday by doing what it has done all year: Winning the turnover battle and getting big plays when the Cowboys needed them. Yes, it must be noted that if Stanford’s kicker doesn’t miss one field goal in regulation and another in overtime, Oklahoma State probably doesn’t come out with the victory. But it did, so let’s look at a play that shows how Blackmon and the Cowboys rallied to win. Oklahoma State has excelled for both of the past two years with “packaging concepts,” and in this case, putting different “coverage-beating” pass concepts to each side of the field. Doing this gives quarterback Brandon Weeden options on where he wants to go with the ball, depending on the pass coverage. On this play, the Cowboys lined up with three receivers to the left and Blackmon, as the split end and the running back, the versatile Joseph Randle, to the right. 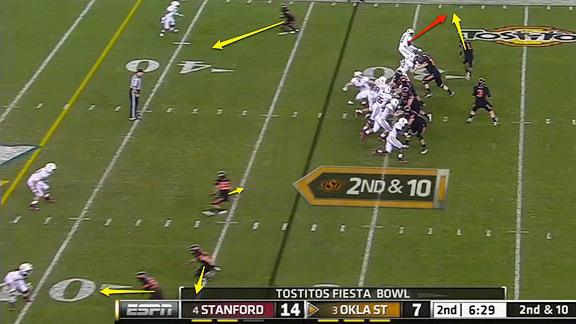 The pass concept to the three-receiver side was a staple of Oklahoma State’s offense: the stick concept. 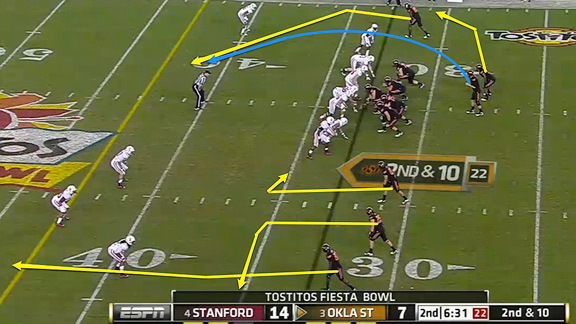 On stick, an outside receiver runs a vertical route and an inside receiver runs to the flat, while a third receiver runs a “stick” route, essentially just hooking up at five or six yards. This creates a stretch on the defense in the form of a triangle, and is good against almost all zone coverages and some man-to-man looks. To Blackmon’s side, the Cowboys ran a simple “slant/flat” combination, where Blackmon runs a slant while the runner runs a route to the sideline to control the flat defenders. This route is good against some zone coverages as well, but it’s primarily here for man-to-man: If Stanford tries to single out Blackmon, that’s where Weeden is going with the ball, and that was what they did. After the snap, Weeden is essentially just looking for confirmation of what he saw earlier: that Stanford had put everyone on the line and was playing man coverage on each receiver, including Blackmon. Indeed, before the Fiesta Bowl, Stanford co-defensive coordinator Derek Mason said the Cardinal was going to defend Blackmon “straight up.” That’s what they were doing on this play, but let’s just say the philosophy changed by the second half. As the play develops, you can see Blackmon has a clean release and Oklahoma State’s offensive line hasn’t let in any unblocked pass rushers. 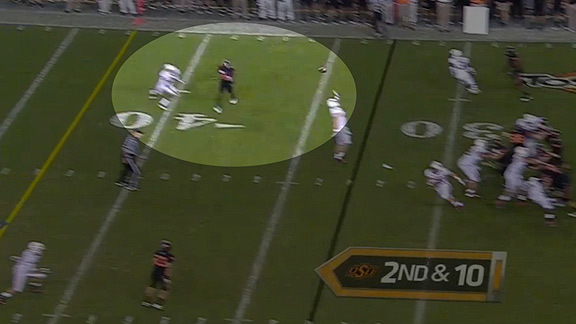 As the ball is in the air, Blackmon does an excellent job of keeping his body between it and the defender. 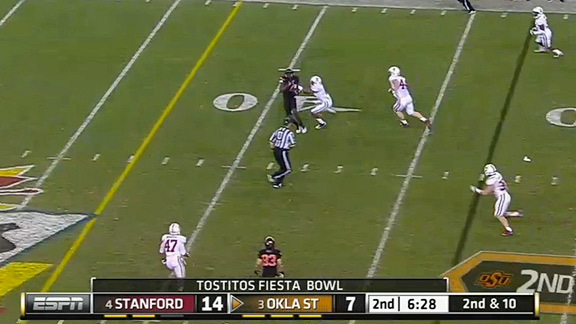 Even if the Stanford defender were much closer, Blackmon has perfect position to catch the slant. Blackmon runs good routes and has decent speed, but what makes him the best receiver in the country is his incredible physical presence on the field. As soon as he catches the slant pass from Weeden, he’s thinking “score,” and he’s already begun wrestling himself away from an open field tackle. When you watch Blackmon, you are reminded of receivers like Terrell Owens and Calvin Johnson. But both of those guys are enormous. Blackmon, by contrast, really just plays big. (He’s actually a shade under 6-foot-1 and weighs 215 pounds.) The lesson is that playing big and aggressively is often as much about the mind as it is the body, and every time he gets the ball or runs a route, you get the feeling that Blackmon would like nothing more than to simply destroy the defender over him. And, on this play — and in this game — Blackmon, Weeden, and Oklahoma State each saw the fruits of that determination and intensity.